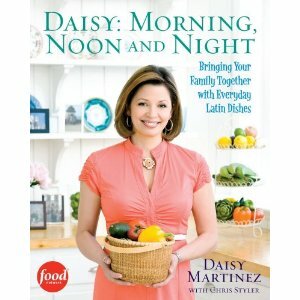 Food Network’s Daisy Martinez is hosting a special Nuevo Latino dinner on Monday March 8th at ~DESTINO~ to introduce her new cookbook, Daisy: Morning, Noon, and Night. Chef James Schenk will utilize Daisy’s vibrant pan-Latin recipes to create a four-course dinner, paired with Argentine wine. The dinner also includes an autographed copy of the new cookbook being published March 16th by Atria Books, and two glasses of wine. A no-host cocktail reception with Daisy at Pisco Latin Lounge (next door to Destino) will kick off the festivities from 6pm-6:30pm with passed appetizers. Daisy’s dinner at Destino will feature celery root, jicama and red pear salad; risotto with pigeon peas; and Peruvian pork roast with onion and pepper stir-fry, accompanied by a glass each of Torrontes and Malbec wines. The meal’s sweet ending of mango-passion fruit panna cotta comes with coffee or tea. The first Latina to host a public television cooking show, Daisy grew up learning the culinary arts from her Puerto Rican mother and grandmothers. After attending The French Culinary Institute with Jacques Pépin, and stints as a private chef and owner of a catering business in New York City, she is known for her Daisy Cooks! on PBS, Viva Daisy! on the Food Network, and her cookbook, DAISY COOKS!